Einstein arrived in the United States in 1933, the year the Nazis rose to power in Germany. From that moment until he died in 1955, J. Edgar Hoover’s FBI—with other agencies—feverishly collected “derogatory information” to undermine the renowned scientist’s influence and destroy his reputation. 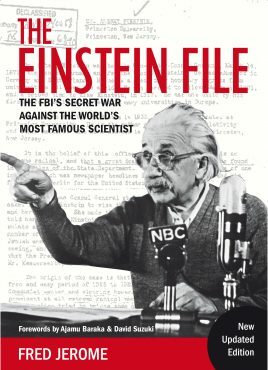 With material accessed under the Freedom of Information Act, Fred Jerome reveals the depth of, and the reasons for, this massive anti-Einstein campaign. He also uncovers Einstein’s strong political commitments that have been conveniently buried under the image of the absent-minded icon genius. Whereas Einstein said on several occasions, “My life is divided between equations and politics,” Jerome delves into his little-known political half-life. 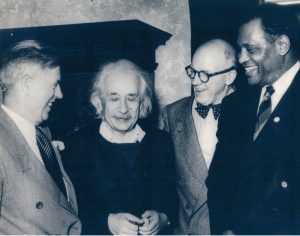 From l. to r., Henry Wallace, Albert Einstein, radio commentator Frank Kingdon, and Paul Robeson at Einstein’s home in Princeton, October 1947. Fred Jerome is a veteran journalist and science writer. His work has appeared in publications, including Newsweek and The New York Times. He taught journalism at Columbia Journalism School, NYU and other universities. Jerome is also author of Einstein on Israel and Zionism and co-author of Einstein on Race and Racism. Ajamu Baraka has been involved in grassroots organizing, international solidarity, and educating for over four decades. He was the Green Party’s nominee for Vice President of the United States in the 2016 election. David Suzuki is a geneticist, broadcaster, and environmental activist. A Canadian of Japanese origin, he and his family were interned during World War II. His work as a broadcaster, particularly with CBC’s The Nature of Things made him a unique figure in science and television.